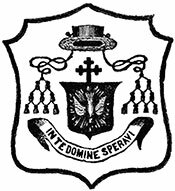 The history of the Diocese of Erie begins in 1789 when the 13 counties of northwest Pennsylvania were considered to be part of the Diocese of Baltimore. This remained the case until 1808, when the entire state of Pennsylvania, along with Delaware and northern New Jersey, became a part of the newly formed Diocese of Philadelphia. Historians might argue that Bishop Francis Patrick Kenrick of Philadelphia was the first episcopal presence over our diocese. 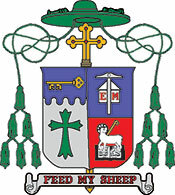 The Diocese of Erie was created by papal decree in 1853, and on October 1, 2012, Bishop Lawrence Thomas Persico became the tenth man named as its shepherd. Who were the nine men on whose shoulders he now stands? The Most Rev. 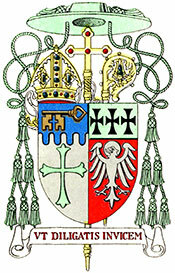 Charles Chaput, archbishop of Philadelphia, mentioned them as part of the communion of saints who would be praying for Bishop Persico during his episcopal ordination ceremony. Father Justin Pino, archivist for the Diocese of Erie, has provided a wealth of personal stories to share about each bishop. These essays provide insight, not only into the life each man led and the work he did for the church in northwest Pennsylvania, but also into how God has provided for our diocese since its earliest days. 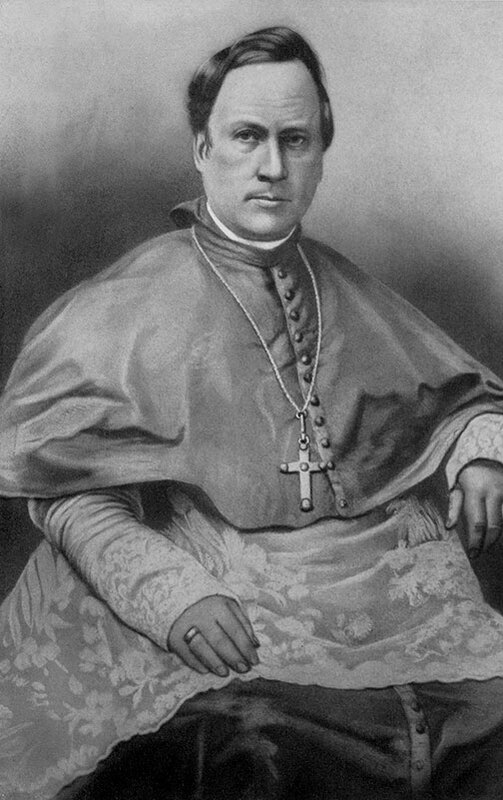 Consecrated on 15 August 1843 at Saint Agatha’s Chapel of the Irish College in Rome, Italy; arrived in Erie as a bishop (formerly Bishop of Pittsburgh) in 1853; served as first bishop of Erie from July 29, 1853 until his transfer back to Pittsburgh on December 20, 1853. Noting that dioceses were being created very rapidly in 19th century America, Father Pino says Rome looked to Europe for new bishops because there were no native clergy at the time. “Essentially, the pope needed him,” he explains. 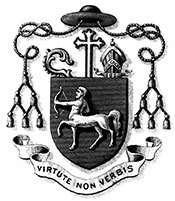 So Bishop O’Connor became the bishop of Pittsburgh in 1843. 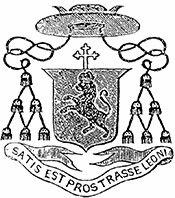 Within a decade, he felt the Diocese of Pittsburgh, which covered the western half of Pennsylvania, was simply too large, so at the Plenary Council of Baltimore in 1852, the Diocese of Erie was created, encompassing the 13 counties of northwest Pennsylvania. Here, the history becomes a little less clear. Bishop O’Connor stayed for only a few months, and there is no record of him having performed any episcopal functions during that time. Somehow, he and Bishop Young were able to essentially trade assignments, and both the bishops and the people of both dioceses were apparently satisfied with the new arrangement. 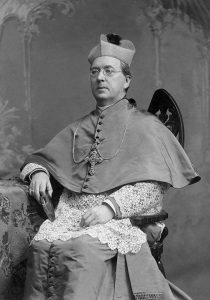 Happily for Bishop O’Connor, in 1860 he received permission from Rome to retire, at which time he was finally able to become a Jesuit. Bishop O’Connor died in 1872, and is buried in a traditional Jesuit grave with his community in Woodstock, Maryland. The cross on his simple gravestone is, however, three inches higher than that of his brothers, indicating that he served as a bishop of the church. Consecrated on 23 April 1854 at the Cathedral of Saint Peter in Chain in Cincinnati, Ohio; arrived in Erie as a bishop (having been previously consecrated in Ohio) in 1854; served as second bishop of Erie from December 20, 1853 until his death on September 18, 1866. 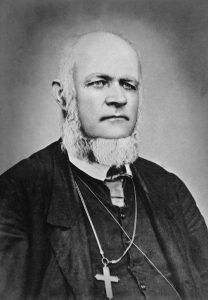 Our first American-born bishop, Bishop Joshua Maria Young converted to Catholicism when a coworker introduced him to the faith. Bishop Young was raised in the Congregationalist faith, a Protestant tradition of English origin similar to the Puritans. (His given name was Josue Moody Young; he took the name Joshua Maria when he was baptized into the Catholic faith. )Before he became a priest—or even Catholic—Young worked at a New England newspaper, where the only Catholic in its employ constantly dealt with anti-Catholic sentiment and hate. Bishop Young was very off ended by this. When his coworker showed him Catholic literature, Bishop Young fell in love with the faith and converted. And when he converted, he fell deeply in love with God, going so far as to ride on horseback from New England to Cincinnati, Ohio, as a missionary priest. Bishop Young served briefl y as bishop-elect of Pittsburgh, but as indicated in the story of Bishop O’Connor, switched assignments with his predecessor in 1854 and carried out the rest of his years as bishop of Erie. “For all intents and purposes, he was the first bishop to truly serve as our bishop,” Father Pino says. Bishop Young led the diocese during a politically turbulent time. Edwin L. Drake drilled the first oil well in northwest Pennsylvania, launching the modern petroleum industry in 1859, and the Civil War tore at the fabric of the nation in the early 1860s. Bishop Young actively supported the Union during the war, and was known for his legendary patriotic speeches supporting Abraham Lincoln. Bishop Young traveled often—“he was good in the wilderness,” says Father Pino—and he oversaw the generation of many new parishes. The people of the diocese were grateful to have a full-time bishop and not just a shepherd who dropped by once a year. Bishop Young died suddenly—likely of a heart attack —on Sept. 18, 1866. Consecrated on 2 August 1868 at Saint Paul’s Cathedral in Pittsburgh, Pittsburgh; arrived in Erie as a bishop (having been previously consecrated in Pittsburgh) in 1868; served as third bishop of Erie from March 3, 1868 (following a nearly two-year interregnum when Vicar-General John Coady served as apostolic administrator) until he resigned on September 15, 1899. After Bishop Young died, the Diocese of Erie went through two years without a bishop at all. Msgr. John D. Coady, the vicar general of the diocese and also the pastor of Saint Joseph Parish in Oil City, served as apostolic administrator and oversaw confirmations and appointments.Msgr. Coady had the legal affections of a bishop and aided in the establishment of three or four parishes during that time. “He was a sturdy hand to steer the rudder of the ship,” Father Pino says. 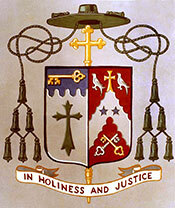 Bishop Tobias Mullen, born in Ireland, was appointed bishop of Erie in 1868. Prior to his appointment, Bishop Mullen was a priest and vicar general of the Diocese of Pittsburgh and also served a great deal of time at parishes in what is now the Diocese of Altoona-Johnstown. He left a big mark on the Diocese of Erie: His crowning achievement as Erie’s shepherd was the construction of the St. Peter Cathedral on Ninth and Sassafras streets. People thought he was crazy—at the time, the location was at the edge of the wilderness. But Bishop Mullen had vision, and saw the potential for growth of the area. Construction on the cathedral began in 1873 with $9,000; an additional $250,000 was raised by generous Catholics from all across the diocese over the next 20 years. At a time when anti-Catholic sentiment was running high, the building of the cathedral bolstered the unity of Catholics in Erie. Socioeconomically, the landscape of the diocese changed greatly under Bishop Mullen’s leadership. By 1880, the influx of immigrants into the U.S. was in full force. The cathedral was completed in 1893, just in time to serve the growing population of Erie. But while the cathedral was rising, Bishop Mullen’s health was declining. In 1898, he suffered a paralytic stroke while saying Mass at the cathedral. For the first time in the history of the diocese, the pope appointed a coadjutor bishop—Bishop John Fitzmaurice, who would later become Erie’s fourth bishop. Bishop Mullen resigned from his post in 1899 and died just after the dawn of the 20th century on April 22, 1900. As Bishop Mullen lay dying, Bishop Fitzmaurice said Mass for him at his bedside. He summoned a young neighborhood boy to serve as altar boy and the young boy was so nervous he accidentally washed the bishop’s hands with wine instead of water. He also knocked the bishop’s biretta off his desk and crushed it underfoot. God had big plans for that klutzy server, however. His name was John Mark Gannon. Consecrated on 24 February 1898 at the Cathedral of Saints Peter and Paul in Philadelphia, Pennsylvania; arrived in Erie as a bishop, named coadjutor which meant he came to the diocese while Bishop Mullen was still serving, publicly knowing he would be the successor. Succeeded as ordinary in 1899 and served as fourth bishop of Erie from September 15, 1899 until his death on June 18, 1920. 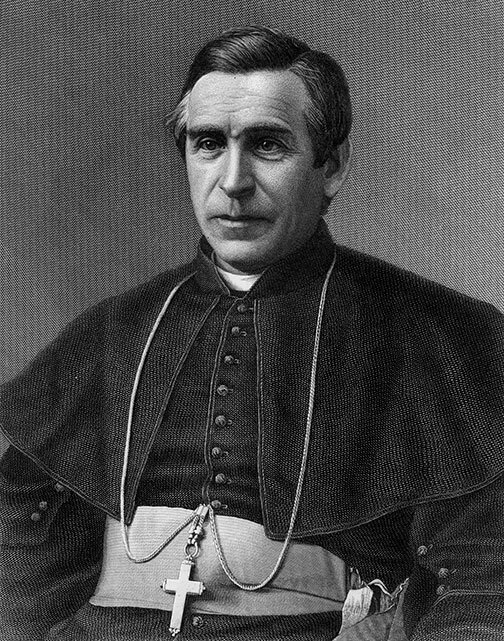 Bishop John Fitzmaurice, an Irish immigrant, accepted the appointment as bishop of Erie in 1899. If Bishop Mullen laid the foundation for the diocese to grow, Bishop Fitzmaurice built it up.The diocese saw great expansion under his leadership—many parishes popped up at the turn of the 20th century, and institutions like Saint Vincent Hospital and St. Joseph’s Orphanage were established, as well. While the red sandstone exterior of St. Peter Cathedral was extraordinary, with its 265-foot-tall central tower and 150-foot-tall twin Norman style towers, the interior was still very simple at the time. Bishop Fitzmaurice lavished it with a marble altar and a pipe organ, to make the inside as beautiful as the outside. He gilded the space with his spiritual gifts, too: Bishop Fitzmaurice was known for his skills as an orator and homilist. Bishop Fitzmaurice had bad eyesight all his life, and eventually went blind. Toward the end of his life, when his eyesight was failing, a little boy who was a member of the cathedral parish would lead Bishop Fitzmaurice through the cathedral for processions. 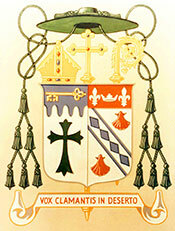 Bishop Fitzmaurice died on June 18, 1920. Consecrated on 6 February 1918 at St. Peter Cathedral in Erie, Pennsylvania; served as auxiliary bishop of Erie until being appointed bishop on August 26, 1920 and served as fifth bishop (later archbishop ad personam in 1953) of Erie until his resignation on December 9, 1966. The title archbishop was given as a personal honor for Archbishop Gannon’s tremendous efforts in the diocese and beyond; it is not usually given to a bishop who is not serving in an archdiocese. If Bishops Mullen and Fitzmaurice had the task of sowing seeds in the Diocese of Erie, Bishop John Mark Gannon heeded the call to harvest them. Much was in bloom in Erie during Bishop Gannon’s tenure—an unprecedented 46 years of service. 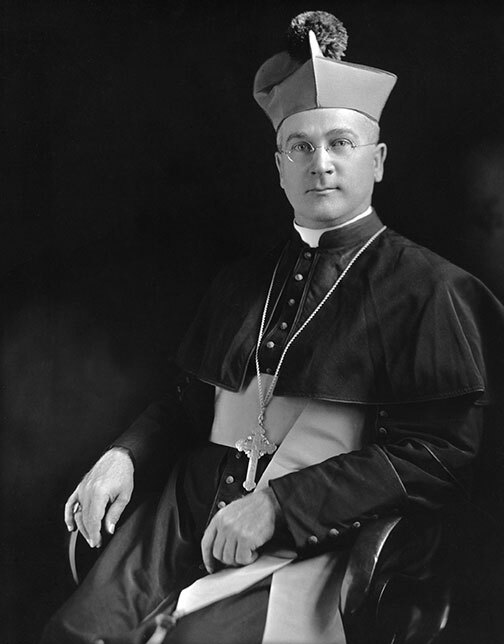 He cared deeply for his home diocese, and consistently worked hard to establish institutions and programs that are still ministering to the Erie community today.Erie’s first “native son” bishop, Bishop Gannon was one of the youngest bishops in the United States at the time of his appointment in 1920. Bishop Gannon’s father, Thomas, was a drummer boy in the Civil War, and his mother, Julia, lived with her son until the end of her life. The precise history is unclear, but legend has it, Father Pino says, that Bishop Gannon was offered the appointment to serve as archbishop of Philadelphia, but refused it. He was rumored to have been offered the same position in New York, but refused that, too. 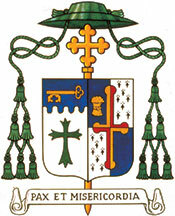 Bishop Gannon reverently delighted in the pomp and circumstance of liturgical celebrations and certainly enjoyed the extras that came along with being named an archbishop: the extra two tassels on his coat of arms, a longer cape and the title “your grace” instead of “your excellency.” Even amid all the formality, Bishop Gannon was quick to interact with people in a personal and meaningful way. An old newspaper photo captured a moment with the bishop playing “stick ’em up” with a barefoot boy sporting two toy six-shooters and a cowboy hat. The bishop, meanwhile, was in full liturgical garb for ordination. The Great Depression settled over the nation in the 1930s, and Erie was not immune. When hobos would throw pebbles at the rectory window, Bishop Gannon would lend them a hand, tossing them money. Bishop Gannon had a passion for education. He established Cathedral College—later to become Gannon University—as well as the regional Catholic high schools and St. Mark Seminary. In response to the persecution of Catholics in Mexico, Bishop Gannon helped establish Montezuma Seminary in New Mexico to train young Mexican men who were unable to study in their home country. He sent art professors from the high schools and colleges to study in Europe so they could return and help beautify their campuses. He worked hard to support the Sisters of St. Joseph, the Sisters of Mercy and the Benedictines in their ministries and welcomed the Carmelite sisters to the diocese. In total, Bishop Gannon helped institute 28 parishes, 49 churches, seven rectories and 12 convents and played a critical role in the opening of many hospitals and ministries including Harborcreek Training School for Boys, Gannondale for Girls and the Erie Day Nursery. 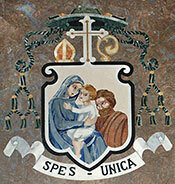 Bishop Gannon was given the unique and rarely bestowed honor of “archbishop ad personam,” Father Pino explains. Even though Erie was not an archdiocese—the typical requirement for a bishop to receive the archbishop title—the “ad personam” distinction is a personal title given for great service to the Catholic Church. Toward the end of his life, when he was in his 80s, Vatican II began and Archbishop Gannon attended a session with a young priest from Buffalo named Father Donald Trautman. While celebrating one of the first Masses said in English at St. Mark Seminary, Father Pino said, one of the priests looked over at Archbishop Gannon and noticed he was crying. Naturally, he asked the shepherd what was wrong. “I’ve never heard my name spoken in English in the canon before,” Archbishop Gannon replied, tears in his eyes. Even though he was in his twilight years as a bishop during the sessions, Archbishop Gannon embraced the changes that came with Vatican II and was on fire with what it would mean for the future of the church. “The man who loved pomp and circumstance was very open to its renewal,” Father Pino said. 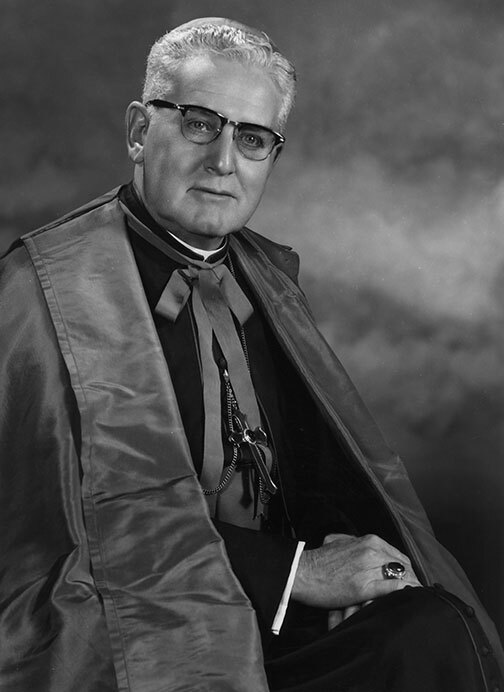 Archbishop Bishop Gannon retired at 90 and died two years later on Sept. 5, 1968. Consecrated on 6 July 1961 at the Cathedral of Saint John the Evangelist in Cleveland, Ohio; arrived in Erie as a bishop (having been previously consecrated in Cleveland as auxiliary bishop of Cleveland) in 1966; served as sixth bishop of Erie from December 6, 1966 until his transfer to Hartford on December 28, 1968. Before he came to the diocese as the sixth bishop of Erie in 1966, Bishop John Whealon requested a photo of every priest. When he arrived to begin his term as bishop, he had all of their faces and names memorized. 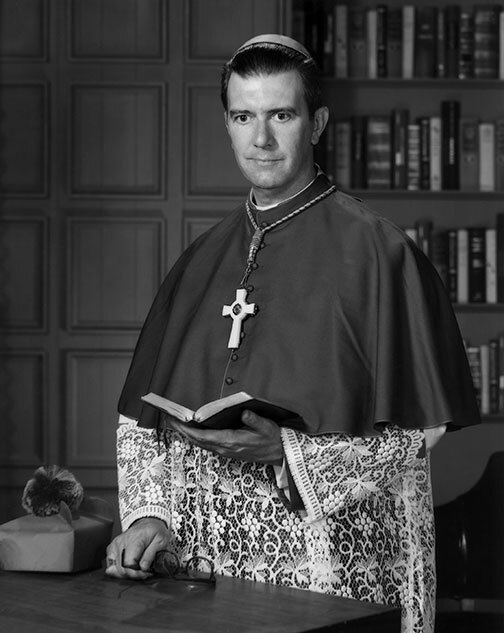 Father Pino noted that this bishop was “very practical”—an austere, traditional man with an amazing memory.Archbishop Gannon was still alive at the time of Bishop Whealon’s appointment as bishop, and Bishop Whealon volunteered to live in the penthouse of St. Mark Seminary while Archbishop Gannon continued to live at the residence. At the penthouse, Bishop Whealon installed a greenhouse—he loved to garden and nurture his plants. Just two years after moving to Erie from his former post as auxiliary bishop of Cleveland, Bishop Whealon was transferred to the Archdiocese of Hartford in 1968 and remained there for the next 22 years. He died unexpectedly in 1991 from intestinal cancer, just one year after the succeeding bishop and his very good friend, Bishop Alfred Watson, passed away. Bishop Whealon preached at his friend’s funeral, and Father Pivno still has the original handwritten homily in the diocesan archives. “He took. He broke. He saw. He gave,” Bishop Whealon wrote. Consecrated on 29 June 1965 at Saint Peter Cathedral in Erie, Pennsylvania; served as auxiliary bishop of Erie until succeeding as bishop on March 17, 1969 and serving as seventh bishop of Erie until his resignation on July 16, 1982. Bishop Alfred Watson, a native of Erie, grew up in the St. Peter Cathedral parish family: He was baptized, received all his sacraments and even celebrated his first Mass there. 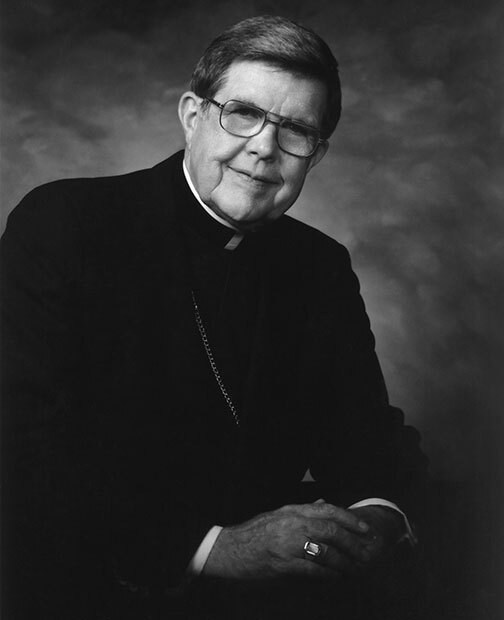 He served as auxiliary bishop of Erie from 1965 to 1969 and was installed as the seventh bishop of Erie on May 13, 1969. He loved history, and taught at Cathedral Preparatory School. Bishop Watson flowed with the signs of the times as the church became global and established the diocesan Mission of Friendship together with Archbishop Manuiel Ruiz Castro of Yucatan in 1971. He was great friends with the other priests in Erie. When Bishop McManaman died in 1964, Bishop Gannon was still in need of an auxiliary bishop, and Bishop Watson took on the post. In the midst of the Second Vatican Council reforms in the 1960s, it was a challenge for all U.S. bishops to handle conflicting views in their dioceses, and it was especially challenging for Bishop Watson, as a native son of Erie now coming to grips with his new leadership role. When he broke a hip in 1980, Bishop Watson retired and Bishop Murphy took the reins. Bishop Watson died at the age of 80 on Jan. 4, 1990. 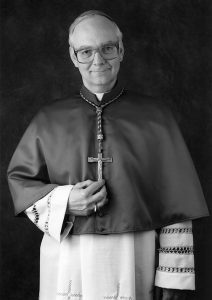 Consecrated on 11 June 1976 at the Cathedral of Saint John the Evangelist in Cleveland, Ohio; arrived in Erie as a coadjutor bishop (having been previously consecrated in Cleveland as auxiliary bishop of Cleveland) in 1978; succeeded as ordinary on July 16, 1982 and served as eighth bishop of Erie until his resignation on July 1, 1990. A gregarious, kind leader, Bishop Michael Murphy served as the auxiliary bishop of Cleveland for two years before traveling to Erie when he was appointed as the second coadjutor bishop of Erie in 1978. His motto, “Peace and compassion,” fared him well: He was a people person and cared very deeply about getting people to work together. This came to light particularly in his work on “Share His Gifts – His Mission,” a capital campaign which organized funds to renovate the cathedral, among other projects. The song, “When Irish Eyes are Smiling,” comes to mind, Father Pino says, when seeking to describe Bishop Murphy’s cheerful, gentle and pastoral demeanor. “He would do anything for you,” according to the archivist. As co-adjutor, he enjoyed his visits to parishes and institutions throughout the diocese. He also sought to improve the region’s Catholic schools, wrote a pastoral letter on marriage and instituted a marriage preparation program for all couples looking to marry in the church—all before officially becoming bishop upon Bishop Watson’s retirement and becoming the eighth bishop of Erie in 1983. Bishop Murphy took care in setting up programs and procedures to improve the diocese. He was concerned about the growing stress on priests as they took on more roles in the modern church, so he established the Emmaus program, an annual retreat for priests and deacons to experience spiritual renewal and fellowship. He instituted a new set of guidelines on mandatory retirement for priests at age 75, although he himself was tireless, once quipping that he should replace the symbols on his coat of arms with the Energizer Bunny. Bishop Murphy should also be remembered for consolidating all of the diocesan offices at St. Mark Catholic Center, as well as for requiring each parish to have a finance council, ensuring a stable future for their parish communities. Bishop Murphy lived to be 91 years old. Resigning from his post as bishop in 1990 and passing on in April 2007—just after receiving the Eucharist that morning—he was the longest retired bishop in the history of the diocese. He spent the majority of his retired years living at St. Patrick Parish in Erie. Consecrated on 16 April 1985 at Saint Joseph Cathedral in Buffalo, New York; arrived in Erie as a bishop(having been previously ordained in Buffalo as auxiliary bishop of Buffalo) in 1990; served as ninth bishop of Erie from July 16, 1990 until his resignation in July 2012. Bishop Donald Trautman arrived in Erie after having served as auxiliary bishop in the Diocese of Buffalo, N.Y. Unlike the end of his own tenure, which would last more than a year beyond his 75th birthday, his succession to the episcopacy was actually announced prior to Bishop Murphy’s 75th. Providentially, the day his announcement was made public, the priests of the Diocese of Erie were enjoying their Emmaus retreat at Christ the King Seminary in Buffalo. So while the announcement caught everyone by surprise, it was compounded by the fact that their new bishop was actually rector of the seminary in which they were gathered. Thus began the third longest tenure of any bishop of Erie to date—22 years. This stands behind only Bishop Mullen who served for 31 years, and Archbishop Gannon who served for 46. Father Pino notes Bishop Trautman’s courageous energy in bringing the church into the world as envisioned by Pope John XXIII. Bishop Trautman’s background as a Scripture scholar played a role in his work within the local and the national church. “His attention to homilies, particularly those he created for confirmations, for example, always reached young people at the particular moment, time and place in the world,” says Father Pino. He also points to the renovation of St. Peter Cathedral in Erie as a crowning achievement.